Please join Jeremy Hummel on Saturday, October 1st, 2011 for a free drum clinic at Dale's Drum Shop in Harrisburg, PA. There will be two clinics (12 noon & 2:30 p.m.). Jeremy's clinics are centered around methods that you can use for any musical style to get yourself in a band and keep yourself in demand. Jeremy will be going over concepts such as "Achieving Better Balance on the Drum Set", "Practicing Moods" and "Maximizing Practice Time." In addition, Jeremy will be bringing bassist Andy Seal. The tandem are currently the rhythm section for the dance band "Into The Spin" and jazz trio "EVE." Together, they will demonstrate and discuss concepts that help the groove breathe, creating a solid foundation, etc. 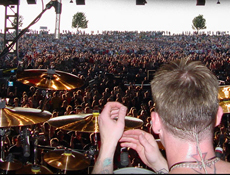 Jeremy is a Modern Drummer contributor, was a featured clinician at PASIC 2010 in Indianapolis and the original drummer of platinum-selling rock band Breaking Benjamin. There will be special pricing on all Pearl, Sabian, Vic Firth, LP, and Evans/Puresound gear in stock.